In todays global market many companies have to operate on a European level. This means the movement of machinery and containers between their various operating bases and client locations. Gateway Transport moves machinery and goods across all of Europe. With a fleet of flatbed trailers to fit all types of loads, low loaders for particularly heavy goods we’re well equipped to transport whatever you have to wherever you need. Wherever you’re based, we can provide haulage services of heavy machinery and goods to any destination around the UK, Ireland and Europe. 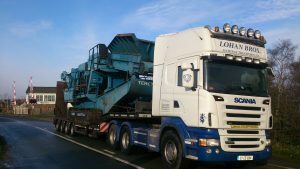 Lohan Brothers T/A Gateway Transport Ltd. are an Irish, family ran, haulage business based in Williamstown, Co. Galway. Edward Lohan founded the buisness initally as a General Haulage company. We specialise in heavy and oversized machinery and goods.